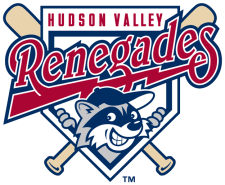 The Hudson Valley Renegades dropped their 2010 season opener against the Aberdeen Iron Birds 5-2 on Friday night at Ripken Stadium. Aberdeen took the lead in the second inning. Tyler Kolodny doubled to left to lead off the inning then advanced to third on a single by Kipp Schutz. David Anderson followed with a line drive to right that scored the runner and gave the Iron Birds a 1-0 lead. The Renegades battled back to tie the game in the sixth inning. That's when Robby Price went deep for a solo home run, his first professional home run, tying the game at 1-1. But Aberdeen took a large lead in the bottom of the sixth inning thanks to four extra base hits in the inning. RBI triples by Shutz and Jeremy Nowak as well as an RBI double by Adam Gaylord accounted for four runs in the inning to increase the lead to 5-1. The Renegades added another run to their total in the top of the ninth. Burt Reynolds doubled to right to lead off the innings. Reynolds advanced to third on a wild pitch and then later scored on a ground ball by Bennett Davis. The Renegades could not push across another run and took a 5-2 loss to the Iron Birds. Devin Fuller made the start, pitching 4 2/3 innings and allowing 1 run on 4 hits while striking out two. Miguel Sierra suffered the loss, surrendering 4 runs (2 earned) on 5 hits with a strikeout in 1 1/3 inning. Kevin Chavez pitched the final two innings, allowing no runs on 2 hits with a strikeouts. The Renegades and Iron Birds will match up again on Saturday night at Ripken Stadium. Julius Dettrich is scheduled to start against Scott Copeland.